Have you seen the old Peanuts cartoons with Charlie Brown, Linus, Snoopy, Lucy, and the rest of the gang? Charlie Brown always wears that same yellowish-orange shirt with the black zigzag stripe along his belly. They do a little clip during each show where Lucy holds a football for Charlie Brown to kick. 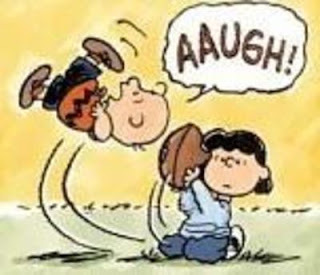 The sad thing is that in every episode as Charlie is going to kick the ball, Lucy moves it at the last second and poor Charlie whiffs the kick, goes feet-first up in the air, and smacks down on his back. So, before each attempted kick as Lucy is enticing the boy to have courage, step up and kick it, Charlie Brown is questioning in his mind if THIS will be the time that he actually gets to kick the ball. Alas, every time he is fooled. It appears that voters have taken the role of Charlie Brown and the Republican Party establishment is wearing Lucy's clothes. Every election cycle, the establishment candidate dangles the bait of fiscal responsibility or an end to abortion or the nomination of Constitutionally-strict judges or some-such conservative carrot. If the latest judgement on the Affordable Care Act (ACA) is any indication, the government will continue to entice voters (from both parties) to put up their money for "The Most Important Election in the History of the Country!" so that the other party does not take away X. Where X is the current bait for voters. When George W Bush was running his campaign against his democratic counterpart, one of the baits thrown out to lure conservatives was that the next president will probably nominate two judges, and we want to make sure that a Republican present is in office to nominate strict Constitutionalist judges so that we can end abortion and shrink government and get back to the way the country was intended to be run. As it turns out, George W Bush did win the election, and he did nominate two judges, but the evidence is now indisputable that he did not nominate conservative judges as promised. With his ruling on ACA, the Chief Justice Roberts has indeed made himself into an activist judge. Now it is being recycled that THIS is the "Most Important Election in the History of the Country!" For Democrats, the temptation for their base is "Send money in to support us so that we can keep this progress that our valiant president has fought for. The evil Republicans are trying to take away your healthcare, and they want you to die without access to healthcare!" For Republicans, the mantra is "Send money in to support us so that we can strike down this obviously unConstitutional law. The evil Democrats are trying to take away your hard-earned money and freedom. They want you to die when healthcare is rationed according to their awful Obamacare law!" It's about money for these scoundrels…both parties! So, Charlie will you make another attempt to kick the football and vote for the latest establishment candidate? Be prepared to end up flat on your back yet again with Lucy holding your wallet. But she'll bat her eyes and look alluring enough for you to try again in four years. Forget the football; it's time to kick Lucy to the curb.